(Nanowerk News) Shiv Khanna, Ph.D., a professor in the Virginia Commonwealth University (VCU) Department of Physics, together with colleagues from VCU, Penn State University and the California Nanosystems Institute, were recently highlighted in the Editor’s Choice section of the journal Science for their work demonstrating how nanomaterials with control of specific properties can be created. For the past decade, nanoscience has been a major scientific focus area globally, paving the way for the development of new materials for applications in the fields of energy, medicine, electronics, magnetics and chemistry. Through theoretical and experimental work, the team found a way to make materials with variable band gaps. The band gap determines the nature of radiation that a material can absorb. According to Khanna, using As73- as an atomic cluster of choice, the team synthesized nanoscale materials that combine As73- clusters with various alkali atoms that donate the charge to As7 clusters and consequently, result in different materials. Experimental measurements revealed that the band gaps vary from 1.1-2.1 eV, even though the assemblies are constructed from identical cluster building blocks. The theoretical work at VCU revealed the nature of the electronic character of As73- clusters and further led to the understanding of how these variations are coming about. “To our knowledge, this is the clearest demonstration of the potential of making materials with adjustable characteristics,” said Khanna. “Our research will open the pathway to materials with applications in energy needs, electronics and magnetic industries. 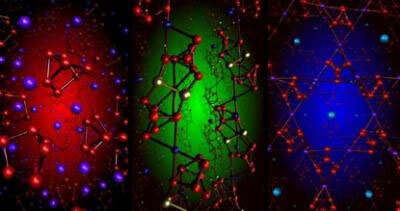 We are also developing ideas for new catalysts that catalyze reactions and also perform other functions,” Khanna said. These findings were published in the January 2010 issue of the journal ACS-Nano – a publication of the American Chemical Society. The work was supported by the Army Research Office through a MURI grant. Khanna collaborated with VCU researchers Arthur C. Reber and Meichun Qian; Ayusman Sen, Ph.D., professor of chemistry at Penn State, and Penn State research associates Angel Ugrino, N.K. Chaki, and S. Mandal; and P. Weiss, Ph.D., director of the California Nanosytems Institute, and distinguished professor of chemistry and physics at Penn State, and H. M. Saavedra, a research associate at Penn State.